When I set out for Hatteras Island the weather was overcast and a bit drizzly, which meant no sun in my eyes as I drove due east. I was grateful for that. I imagine the route I took, which is only two lanes for a good part of the drive, can be hellish with beachgoing traffic on a summer Friday afternoon, but on an early autumn Monday morning it was quiet and calming. I cranked the windows down and listened to some quiet music and craved some breakfast, but I’d already told myself I’d stop for a good lunch once I crossed the Croatan and Roanoke Sounds into the Outer Banks. Three hours later, right at lunchtime, I arrived. I knew I wanted to go to Sam and Omie’s to dine, and only had a vague idea of its location, but like a homing pigeon I went right to it. I was just ahead of the lunch rush and had my shrimp burger and onion rings in no time flat (a continuation of the ruinous eating choices I made in Raleigh). Then I got back in the car, pointed it south on NC 12 and crossed the Herbert C. Bonner Bridge onto Hatteras Island. The northernmost part of Hatteras Island is occupied by the Pea Island National Wildlife Refuge, and once you get past it and the towns of Rodanthe and Salvo, the view gives way to the Cape Hatteras National Seashore. There’s not much to see but dunes, ponds and the occasional sound or sea view. 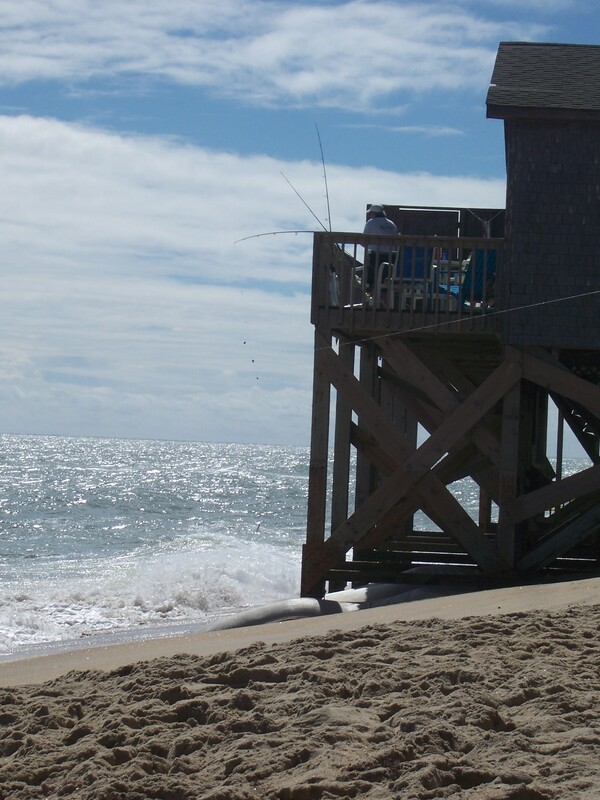 There was a fair amount of repair work being done on NC 12, partly as a result of Hurricane Arthur’s drive-by back in July, and I had to keep my eyes open to the many, often rapidly-changing speed limits as I headed toward Buxton and the Cape Hatteras Motel, my ultimate destination. After another hour’s drive (and a stop at a grocery store in Avon to pick up a few supplies), I arrived, checked in and got my key to my second-floor oceanfront room from Dave, the friendly manager. A little too “oceanfront” for my taste. If you look at the photos of the property from the website link above, you’ll see a big dune and a boardwalk to the beach from the oceanfront rooms. Both dune and boardwalk are gone – casualties, I’m told, of Hurricane Isabel more than ten years ago. Beach erosion here has been quite bad, as you can see from this photo of a property right next to the hotel (note the big sandbags at the foot of the property). I’m sure the guys fishing off the deck thought it was great, but the waves breaking around the property’s foundations would have spooked me a bit, particularly at high tide. At said high tide, the porch outside my room was literally a stone’s throw from the water, and you wouldn’t need to throw that stone very hard. That said, the view from my room was delicious, and once I opened the windows, so was the sea breeze and the sound of the waves crashing. I hauled my stuff from the car up to my room (a bit of a workout, since the motel is a typical Outer Banks mom-and-pop place and has no elevators) and put everything away. 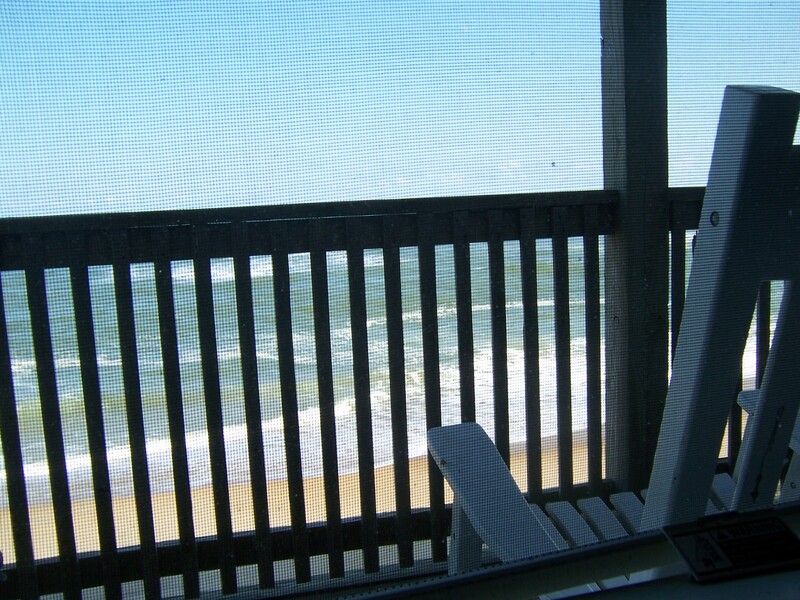 The Cape Hatteras Motel isn’t luxe by any stretch – one of my two dresser drawers was stuck shut and an armchair was so seat-sprung you couldn’t sit in it – but it was the end of the season and I was willing to put up with it for the location. 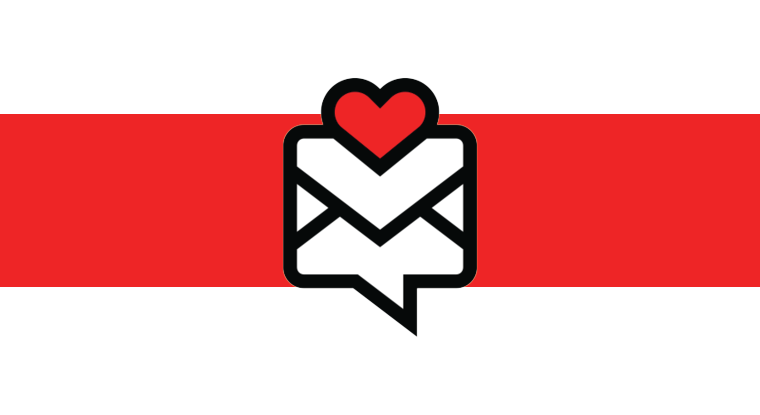 There was a long counter with coffee-maker and toaster where I could prep food, as well as a small refrigerator and a microwave, so I made a pact with myself that I would eat two meals “in” each day to try to get my eating habits back on track. View from my oceanfront window. HAH. I was in the land of fried and broiled seafood, not to mention HUSH PUPPIES, which are like crack to me. I stayed in the first night, creating a nutritionally-responsible dinner from my personal stores and enjoying the experience of writing right by the window with the waves roaring just outside (it was a particularly windy night). I was also a good girl the next day and made breakfast and lunch in my room, since I mostly hung around on the motel’s beach, although I did make a short jaunt to Hatteras Lighthouse in its new location. I’m well-acquainted with the structure, having visited it many times in the past and climbed it with John and Margaret on my last visit (when it was still perilously close to the surf line due to beach erosion), but it was nice to see the old girl in a safe place. I drove out to the lighthouse’s previous location and did a little birdwatching (a Double-Crested Cormorant and a Great Egret, neither of which were new to me but were nice to observe all the same) then headed back to the hotel, showered, changed clothes and went to The Captain’s Table for dinner. I don’t remember what I had – a glass of wine and a broiled seafood dinner of some kind which was good – but I made a pig of myself on the hush puppies and then waddled back to my hotel room and wrote for a while, with another glass of wine and some totally unnecessary munchies to keep me company. I went to bed early as I hadn’t slept well the night before (never do, in a new place) and because I was getting up early to go to Ocracoke Island in the morning. An Apple Ugly – about a quarter of the way in. 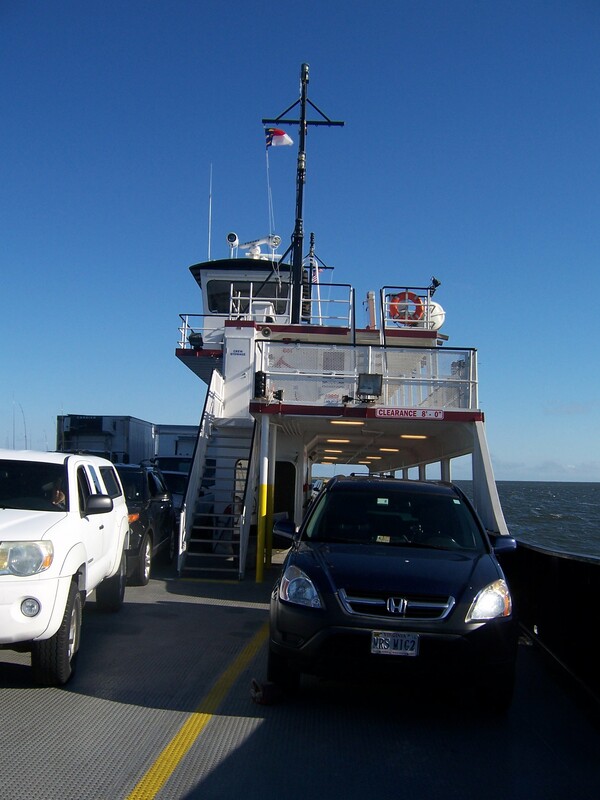 Since Ocracoke is only accessible by air or boat, I did what most folks do and took the ferry. 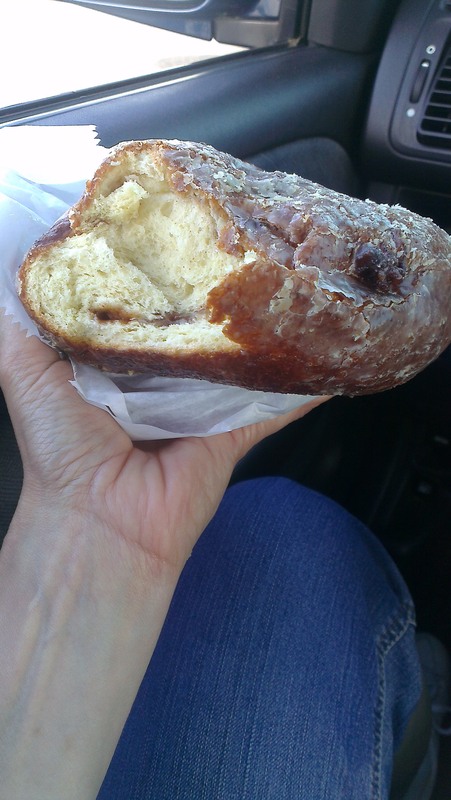 Since I love ferries and was still feeling nutritionally reckless, I stopped at the Orange Blossom Bakery and Cafe and bought one of their famous Apple Uglies, a ginormous apple fritter which cost, I think, all of $3.50. I put it aside while I drove to the ferry station at the very end of Hatteras Island, although the urge to pick at it during the trip was almost more than I could stand. I pulled into the line for the ferry and with about twenty minutes to kill, chowed down on the Ugly. IT WAS DELICIOUS. Kind of insanely delicious, and every bit the size of my whole hand, fingers and all. I ate two-thirds of it and forced myself to wrap up the rest of it up. I washed it down with a Diet Pepsi (OF COURSE) and fortunately had some water to wash the sticky goodness from my greedy digits. About then the folks running the ferry starting directing us aboard, and I was lucky enough to get a front-row position. As instructed, I put the emergency brake on, shut off the ignition and watched as they chocked my wheels. The sturdy little Mrs Mig2 on the Ocracoke ferry. It was a gorgeous morning for a ferry ride, but I was glad I’d brought my jacket as it was windy on the water. It was a bit too rough to birdwatch – my binoculars kept jiggling from the chop – but I saw the usual Brown Pelicans and Herring Gulls and more cormorants and lots of other seabirds, and just contented myself leaning on the rail and looking. Other ferry passengers came up to enjoy the view and several of them got splashed when the occasional wave broke over the ferry’s nose. The trip took about 55 splendid minutes – if one could travel in a straight line it would take a fraction of that time, but because of the shoals the ferries have to describe a route that’s like an inverted U – and then we were landing at Ocracoke. There’s not much besides the ferry station at that end of Ocracoke Island; you have to drive another dozen miles to get to Ocracoke Village, passing through more of the Cape Hatteras National Seashore. Ocracoke Village is quaint and rather charming, particularly in the off-season when many of the tourist-y places have closed for the season. Many people park their cars and rent golf carts to get around, but as the village isn’t that big and I have two perfectly functional legs, I didn’t see the point. I parked near the southern ferry docks (where you can take a ferry to Cedar Island or Swan’s Landing), paid a quick visit to the Ocracoke Preservation Museum (where I learned, to my surprise, that figs are HUGE in Ocracoke – another thing to love about it) and then set out walking to the Ocracoke Lighthouse. 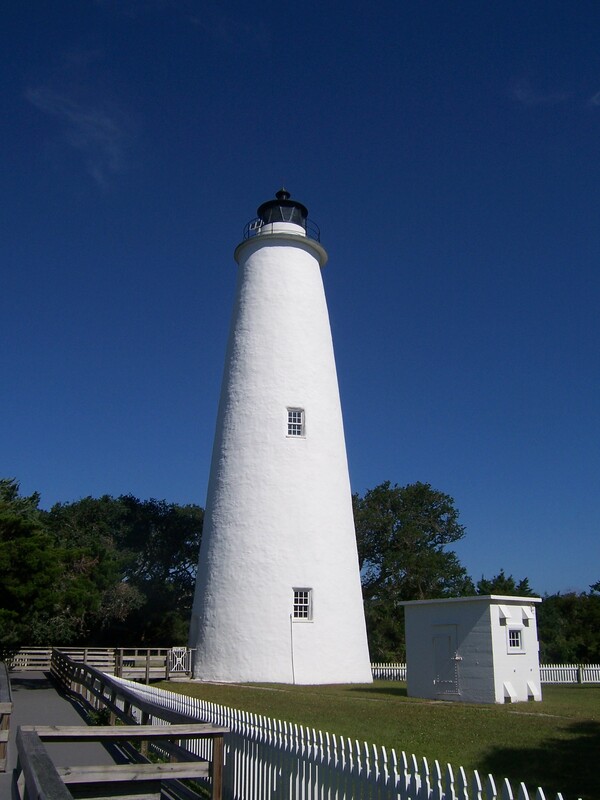 The plump and comely Ocracoke Lighthouse. It’s a squatty little structure, nothing like its towering cousin on Hatteras, and you can’t climb it, but it still looked pretty in the morning light. Did I mention it was a beautiful day? As it got warmer, I stripped off my jacket to enjoy the sun, but nearly put it back on as I made a side trip through Springer’s Point Preserve, which is a maritime forest and reputedly once a hangout of the pirate Teach (better known as “Blackbeard”). I was beset by mosquitoes a short way down the trail and was grateful I’d brought bug spray, although I wished I’d had the foresight to apply it before starting my walk. The trail empties out onto a soundside beach, and I sat on one of the thoughtfully-provided benches and took in the view before heading back. I walked back through the village, finally ending up at Books to Be Red and Deepwater Pottery, where I indulged myself in two books about local history, two bars of scented soap, a pretty cuff bracelet and a nice conversation about Snowy Owls with the lady running the shop. Apparently two of the birds visited Ocracoke during the winter and were quite the media sensation. The lady was kind enough to invite me behind the counter to look at the shop’s Facebook page on her computer, where some wonderful photos of the owls were posted. By the time I finished at the bookstore, it was just after the lunch hour and I thought I’d better find myself something to eat. Many restaurants were closed for the season, but I stumbled upon Dajio, which was open, lucky me. I had one of the best grilled cheese sandwiches of my life there: manchego and Vermont cheddar on country white bread with bacon and green chile chutney. It was so good I could have eaten it twice. 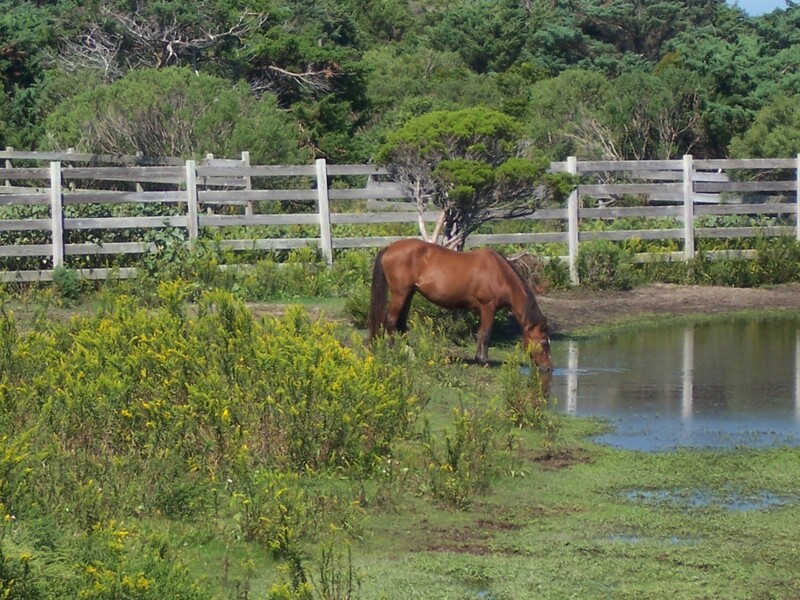 Ocracoke pony stops for a drink. Lunch devoured, I went back to my car and headed back to the northern ferry dock. Along the way I stopped at the Ocracoke Wild Pony pasture viewing site and was treated to a view of a half-dozen or so of the horses, one of which came to a nearby pond for a drink while three Killdeer squawked in the grass close by, as if upset about the pony’s incursion on their turf. Back at the dock, I forced myself to toss away the remains of the Apple Ugly (stale or no, I would have continued noshing on it Because It Was There) and then enjoyed another ride back over the waves to Hatteras. I had dinner in the room, along with more wine, and then enjoyed a solid night’s sleep after so much fresh sea air and sunshine. The next day I mostly loafed on the beach, reading, taking photos, strolling around and watching the surf roll in and out. I didn’t see any dolphins, which was a wee bit disappointing, and most of the shore bird life was comprised of Sanderlings, Sand Pipers and Willets – all familiar to me. 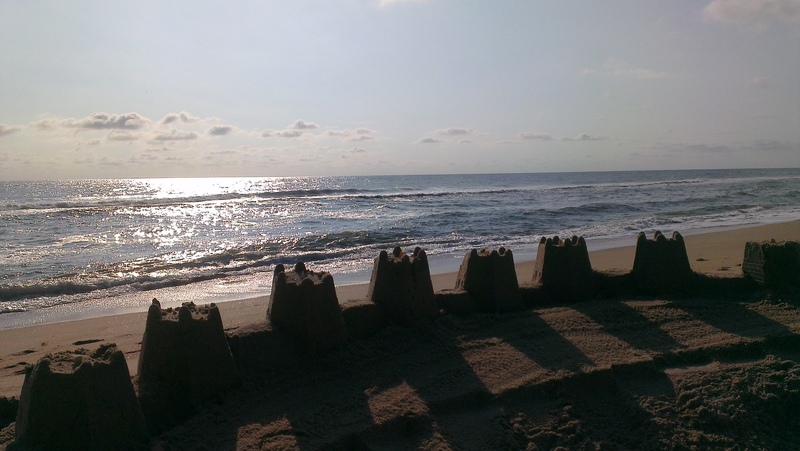 In my rambles I stumbled across the remains of someone’s sand castle, which made a nice photo. After a shower and change of clothes, I went to dinner at Diamond Shoals Restaurant, which was so close I could have walked to it (but I drove, lazy me). I had a delicious broiled grouper filet with a side of very good green beans and MORE hush puppies, and I was such a pig that I asked for seconds of those. I went back to the motel and packed up most of my gear so I wouldn’t disturb anyone when I left in the morning – the motel, which had been largely empty through most of my stay, was starting to fill up with weekend fisherfolk. I got the car partially loaded and then read for a while before turning off the light and enjoying my last ocean lullaby before I dropped off. I woke up before my alarm went off and was able to catch a final shot of the beach at sunrise (I’ll share it with you to conclude this post). I dropped off my key at the motel’s still-closed office and drove north back over the Bonner Bridge. I stopped at the Charles Kuralt trail at the Pea Island National Refuge and did a little birdwatching, where I saw a White Ibis, Louisiana Heron, White Egret (all familiar to me) and a Lesser Yellowlegs (which was not, and got added to my birding Life List). I also got chewed up by mosquitoes and had a near encounter with a confident young racoon when I got off the main trail. 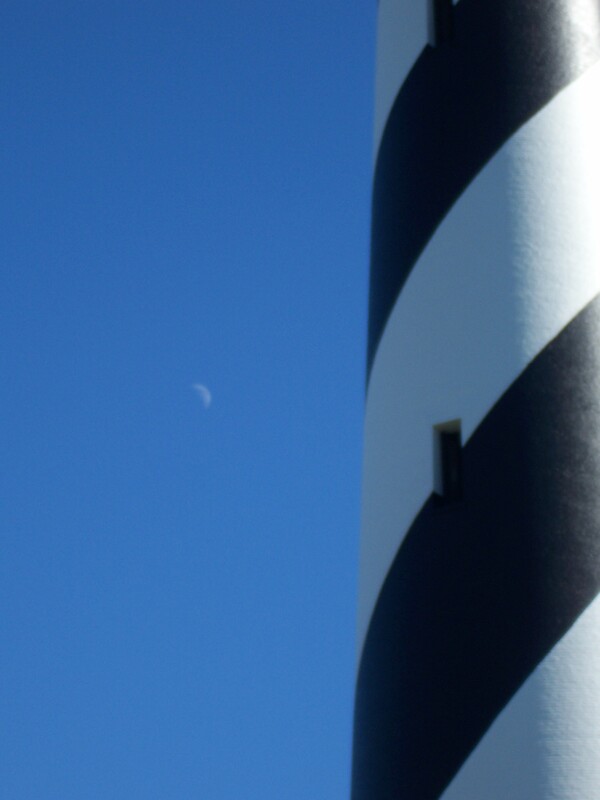 I stopped for a few minutes at the Bodie Island Lighthouse on Nags Head and then continued on home, refreshed and rejuvenated, my little ten-day solo jaunt a rousing success. 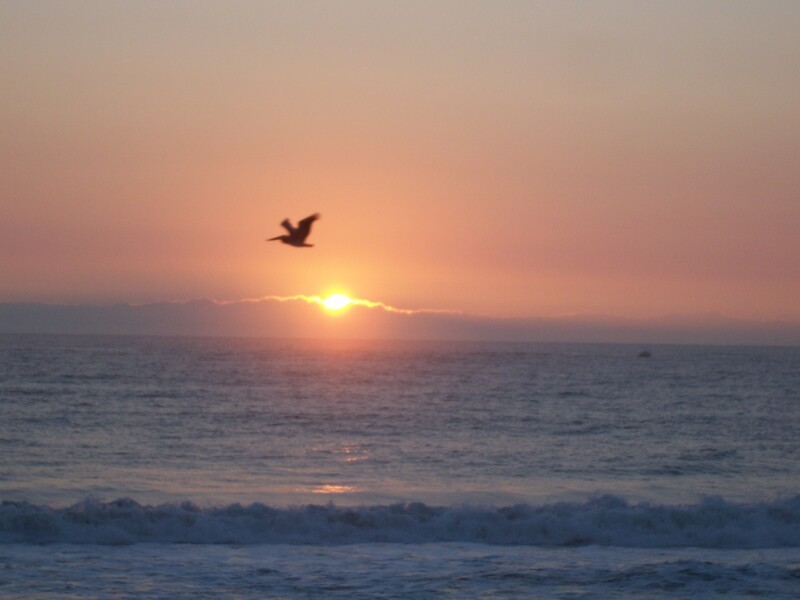 Hatteras sunrise, with pelican flyby.